WTI crude prices are in the $44.50/b-$44.75/b range this morning. WTI opened at $44.68/b today, an increase of $0.43, or 0.97%, below Friday’s opening price. 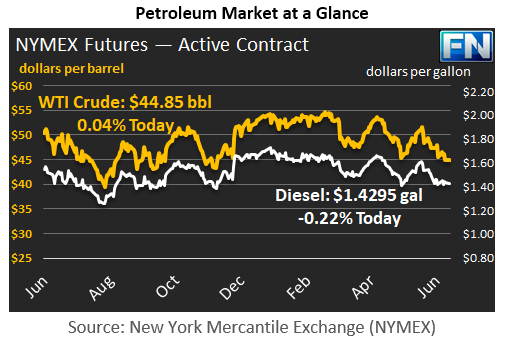 Current prices are $44.85/b, up by $0.11 from Friday’s closing price. Last week, WTI closed at $44.74/b, which was down $1.06 for the week. Today’s opening price was the lowest since November 15th, 2016. Diesel opened at $1.4232/gallon this morning. This was a recovery of 1.19 cents (0.84%) above Friday’s opening price. Current prices are $1.4295/gallon, up by 0.25 cents from Friday’s closing price. 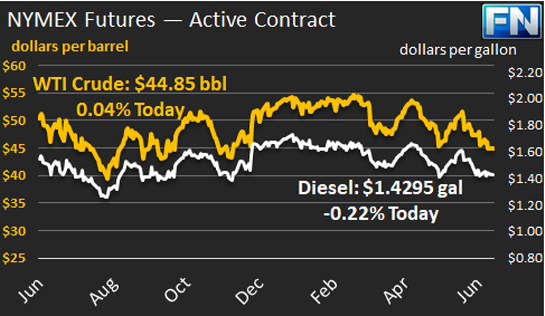 Diesel ended in the red last week, losing 0.42 cents from Monday’s opening to Friday’s closing. Gasoline opened at $1.4523/gallon today, up 1.23 cents, or 0.85%, from Friday’s opening. Prices are $1.4593/gallon currently, up by another .045 cents from Friday’s close. Gasoline prices fell significantly last week, dropping 4.69 cents between Monday’s opening and Friday’s closing. The past two weeks brought mid-week price collapses fomented by weak fundamentals, both in the U.S. and abroad. Crude supply rose, the U.S. active rig count rose, inventories generally rose, and demand was weak. Baker Hughes reported on Friday that the U.S. active rig count had increased by six during the week. The total oil and gas rig count climbed to 933 during the week ended June 16, the largest number since the week of April 24, 2015—nearly twenty-six months ago. The question arises now of what price level will be required to halt advancements in U.S. drilling and production. According to the Energy Information Administration (EIA) in their latest Drilling Productivity Report, it does appear that the production gains are expected to slow between June and July 2017. New well production per rig is forecast to remain essentially flat in most of the major shale plays: Eagle Ford, Haynesville, Marcellus, and Niobrara. Production will rise very slightly in the Bakken region, and rise more significantly in the Utica region. Drilling productivity will decline in the Permian. It is possible that $44/b-$45/b WTI prices will soon be dampening output. If not, technical analysts will be eyeing the next price support level.